Day 3 of the first Test against India, and England have once again had a damn fine day. Where has this team come from and why didn't they show up during the ODI series? England now lead by 247 runs after bowling India out in under 70 overs for 241. 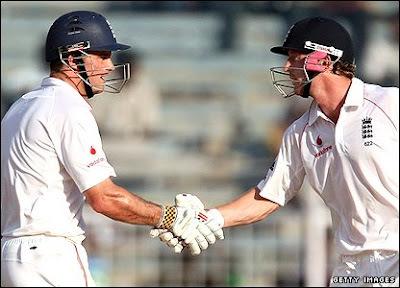 Andrew Strauss (73*) has been a re-revelation. Nightwatchgirl knows he is a great batsman, this isn't news to her, but maybe England should be thinking of sticking him in to the one day side too. England's less reliable batsmen (Cook - still to really prove himself, Bell - sometimes rings, other times misses his cue, Pietersen - two innings and only 5 runs to show for it, that really is poor) left England in a pickle (or other words to that effect) at 43-3, but Strauss and Collingwood (60*) grafted and finished the day on 172-3. Perhaps if Cook spent less time putting on mascara and Pietersen concentrated on the cricket instead of his wife's up and coming performance on the less than classy 'Dancing on Ice,' England might be in an even better position.